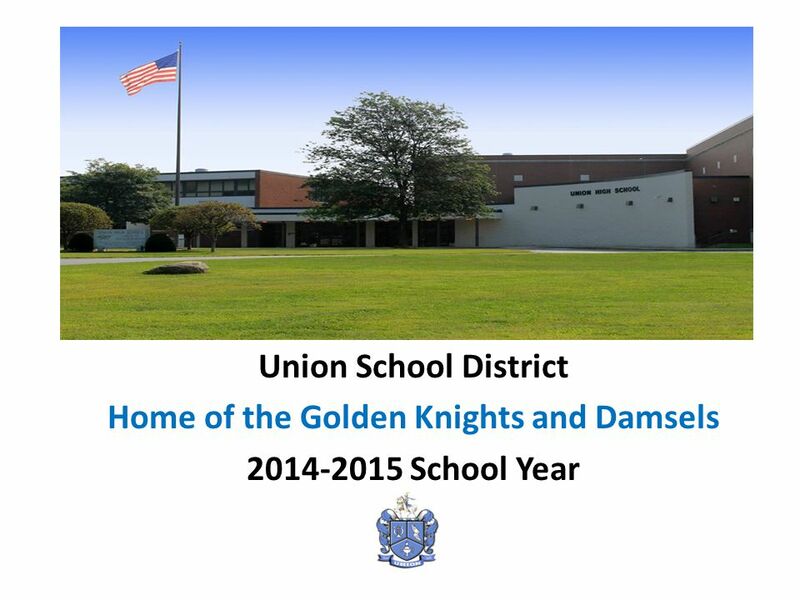 Union School District Home of the Golden Knights and Damsels 2014-2015 School Year. 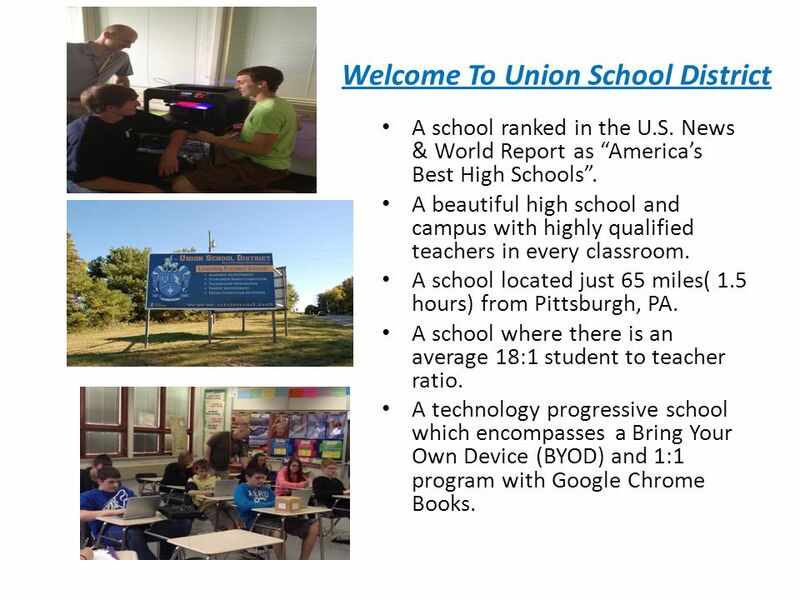 2 Welcome To Union School District A school ranked in the U.S. News & World Report as “America’s Best High Schools”. A beautiful high school and campus with highly qualified teachers in every classroom. A school located just 65 miles( 1.5 hours) from Pittsburgh, PA. A school where there is an average 18:1 student to teacher ratio. A technology progressive school which encompasses a Bring Your Own Device (BYOD) and 1:1 program with Google Chrome Books. 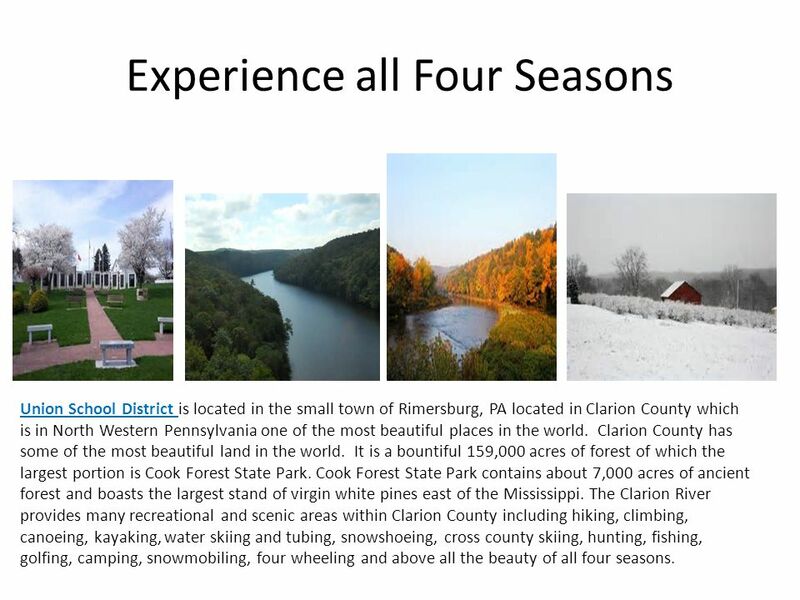 3 Experience all Four Seasons Union School District is located in the small town of Rimersburg, PA located in Clarion County which is in North Western Pennsylvania one of the most beautiful places in the world. Clarion County has some of the most beautiful land in the world. It is a bountiful 159,000 acres of forest of which the largest portion is Cook Forest State Park. Cook Forest State Park contains about 7,000 acres of ancient forest and boasts the largest stand of virgin white pines east of the Mississippi. The Clarion River provides many recreational and scenic areas within Clarion County including hiking, climbing, canoeing, kayaking, water skiing and tubing, snowshoeing, cross county skiing, hunting, fishing, golfing, camping, snowmobiling, four wheeling and above all the beauty of all four seasons. 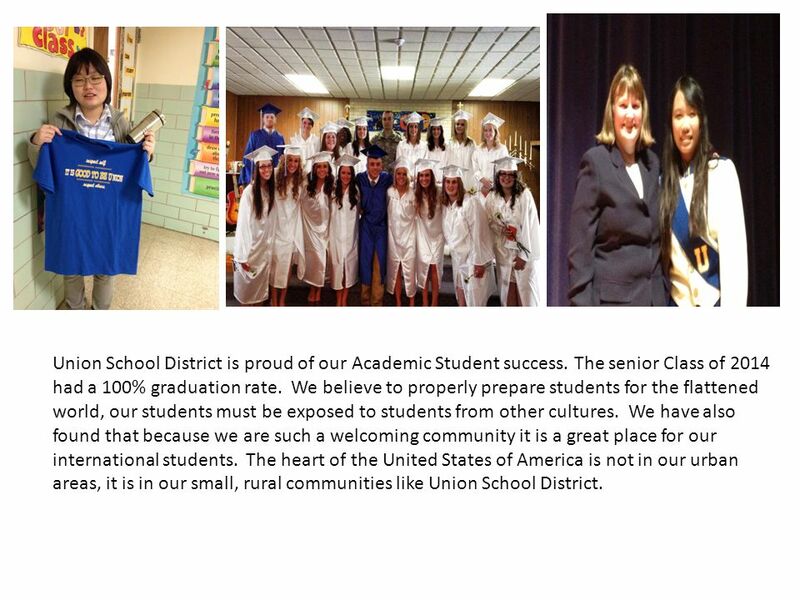 4 Beautiful Rural Western Pennsylvania Union School District welcomes everyone. We offer a safe learning environment for all of our students so they can focus on their education. Administrators, teachers and staff members are extremely involved with the student’s educational programs of study and are actively involved with all aspects of academics and extra- curricular activities. Visitors constantly comment on the beauty of our campus and cleanliness of our facilities. 5 The Union International Outreach (UIO) program was created to welcome students from around the world to embark in an American public education. The UIO program is seeking students beginning in the Fall of 2015. At Union School District our students and international students not only will go to class together, they are classmates enjoying free time. International students will be housed with local families and they will become members of their adopted homes. 6 The past two years Union School District hosted international students and it was a wonderful experience for the school and community. 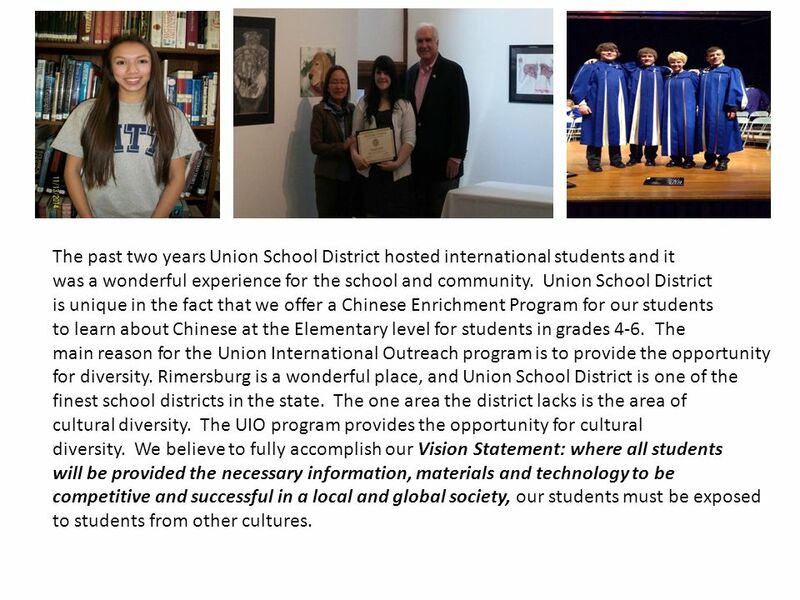 Union School District is unique in the fact that we offer a Chinese Enrichment Program for our students to learn about Chinese at the Elementary level for students in grades 4-6. The main reason for the Union International Outreach program is to provide the opportunity for diversity. Rimersburg is a wonderful place, and Union School District is one of the finest school districts in the state. The one area the district lacks is the area of cultural diversity. 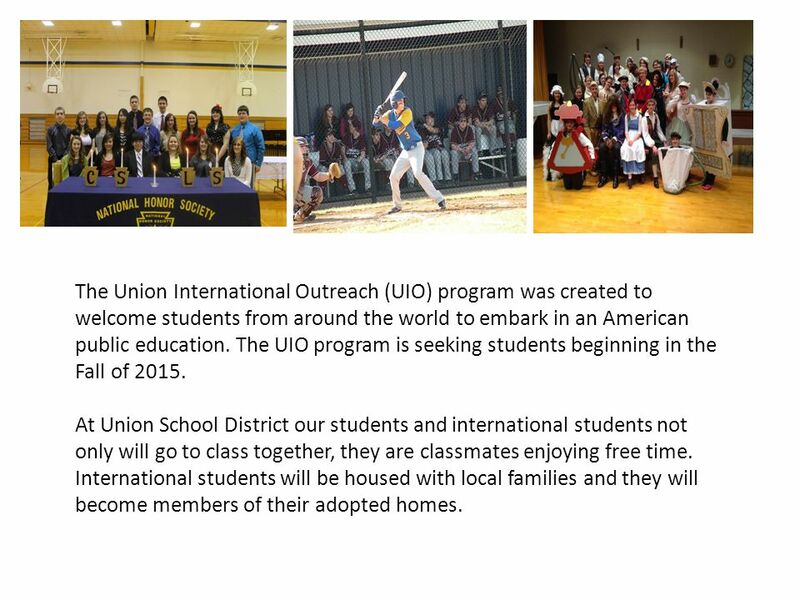 The UIO program provides the opportunity for cultural diversity. We believe to fully accomplish our Vision Statement: where all students will be provided the necessary information, materials and technology to be competitive and successful in a local and global society, our students must be exposed to students from other cultures. 7 Union School District is proud of our Academic Student success. The senior Class of 2014 had a 100% graduation rate. We believe to properly prepare students for the flattened world, our students must be exposed to students from other cultures. We have also found that because we are such a welcoming community it is a great place for our international students. The heart of the United States of America is not in our urban areas, it is in our small, rural communities like Union School District. 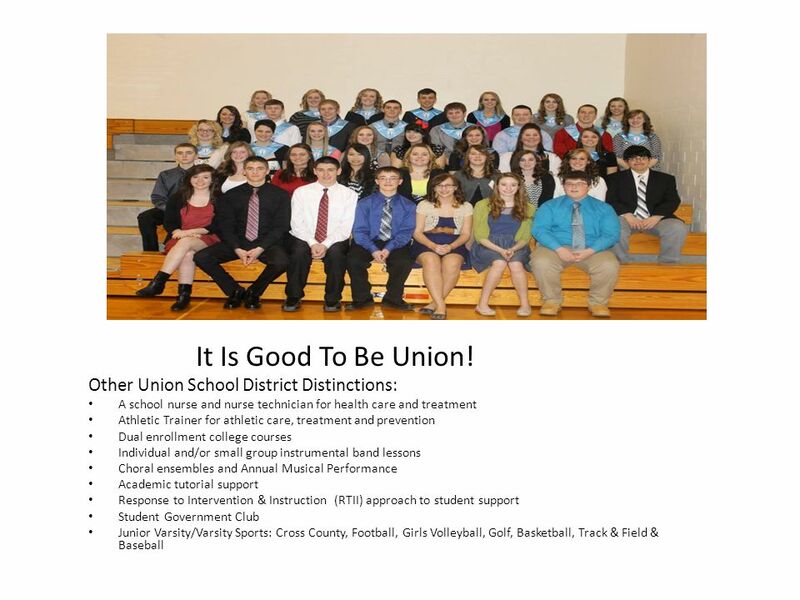 8 Union School District is a school of distinction. While one of the smallest in Pennsylvania, our students historically have excelled in college, military and/or career. Pennsylvania provides a standards based education and has state wide exams necessary for graduation. Our dual college/high school courses currently leading up to 12 college credits per year. Our Distance Learning allows our student to receive courses from all over the state that our restricted schedule might not allow. 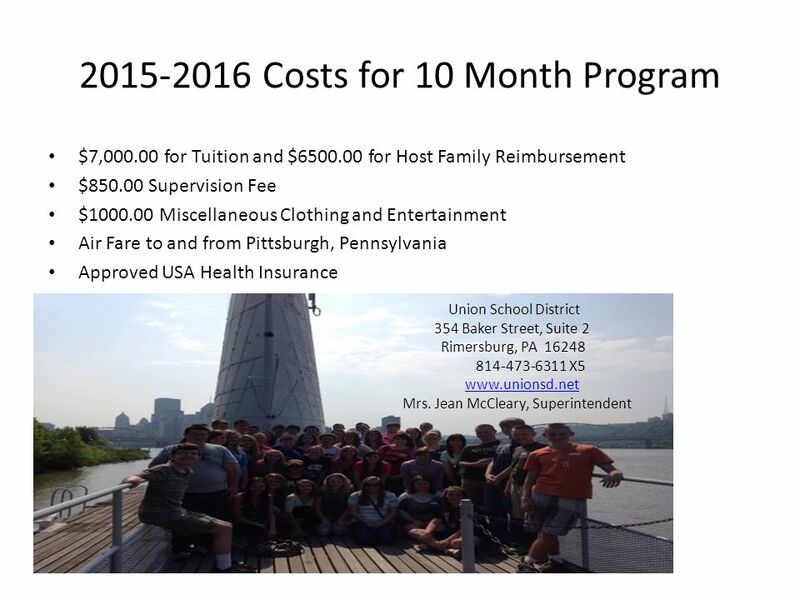 UNION SCHOOL DISTRICT PROVIDES A PRIVATE EDUCATION AT A PUBLIC SCHOOL COST!! 9 The greatest advantage of a small school is everyone does everything. At Union School District, students who never played a sport or participated in the performing arts have learned to do so while staying with us. It is not unusual for a student to sing, play in the band, be in a club, play varsity sports, join youth and government & perform in drama. *Please Note: Athletic eligibility or participation is not guaranteed. 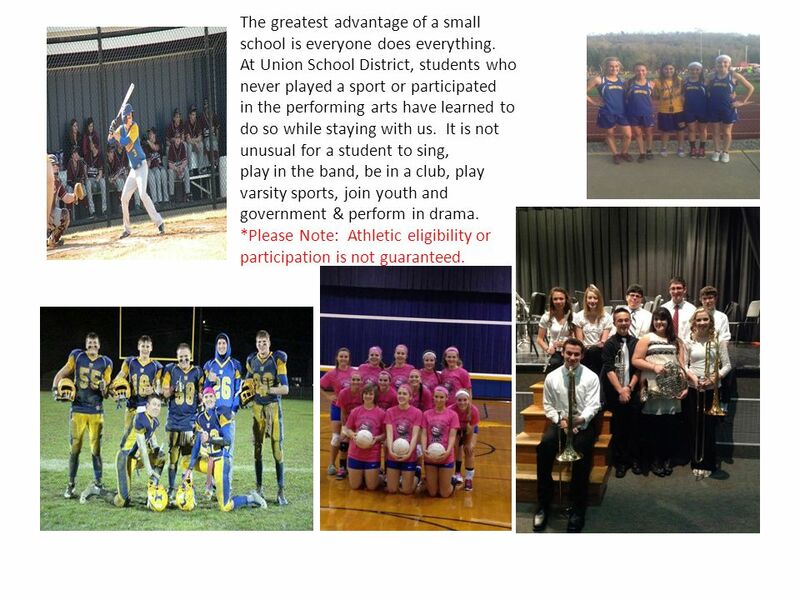 Download ppt "Union School District Home of the Golden Knights and Damsels 2014-2015 School Year." How to Choose a College. Curriculum Look for the schools that offer the right courses and have the right facilities for the kinds of studies you want. Academies: Moving from Good to Great. In order to take the next step from good to great, Round Rock ISD is transforming its high schools into smaller. Welcome to Mission International Program Vancouver Region British Columbia, Canada Where your educational experience prepares you to live in the international. State of the School September Thankfulness Since its inception in 1997 Heritage has impacted the lives of 100’s of students and families. Welcome to Hickman Mills Junior High What every Freshmen Needs to know. Success High School Presented by: Amy Cordrey Andrew Terry Gene HeffingtonBrennon Sapp November 30, 2004 A 635 Public School Finance. Hanover-Horton Middle School Points of Pride. Academic Excellence MEAP Scores are consistently high MEAP Scores are consistently high Highest MEAP scores. Welcome Class of 2018!. All students will take challenging courses that build academic stamina. All students will be college/career ready. All students. EASTERN OREGON HEAD START ANNUAL REPORT Offering dedicated services to Baker and Union Counties since 1968. Rankin School District 98 Home of the Rebels Our School is a Great Place to Learn. Where in the USA is NKU? A Few Facts about Northern Kentucky and the Greater Cincinnati Area A region at the heart of the United States but on the edge. Future 7 th Grade Registration North Ridge Middle School. Hanover-Horton Middle School Points of Pride. Academic Excellence MEAP Scores are consistently high MEAP Scores are consistently high 8 th Grade MEAP. We prepare students to Create the Future. safest college town in Michigan Reader’s Digest Founded in 1885 7,131 students 14,000 residents Ranked.